It doesn’t matter if you are an advanced student or a complete newbie to the world of Kung fu or other martial arts; you have at some point come across the colored Karate belts and Kung Fu sashes that easily catch onlookers’ eyes. Most people know from television and movies that a black belt in karate represents a trained dangerous expert. But, they have no idea about the colors and rankings that the various colors represent in kung fu or Wing Chun. Are Kung Fu Sashes the Same as Karate Belts? The answer to this question is both yes and no. The basic idea is the same, as it’s a way to easily distinguish expertise without the need for everyone to wear entirely different uniforms for that task. But, the color scheme does not have to be identical. In karate, the belt system is designed as a way to display the practitioner’s specific skill level. In most instances in karate, the darker the belt, which is also referred to as an obi, the more skilled the wearer. So, a black belt would be ranked higher than a blue belt who is in turn ranked higher than a white belt. Kung fu has its roots in China whereas karate has its roots in Japan. The two are as different as their place of origin. While karate and other forms of Japanese martial arts like judo developed belt systems, kung fu and Wing Chun were late to the party. Kung fu belts or sashes are more of a modern day concept. Because of the lack of use of sashes in traditional kung fu and Wing Chun the ranking order of the colors is absolutely not set in stone. Many schools set their own order, which is usually loosely based off of the Japanese system; thus, white is for a beginner and black is for a master. 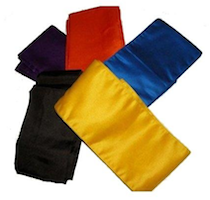 One notable difference is that in kung fu, if the school uses a sash color ranking system, the lead or top teacher will often wear a gold colored sash. This differentiates them from the other teachers or masters at the school or training center. In the world of kung fu and Wing Chun there is some debate about the legitimacy of using sashes as a ranking system. Since they are a modern adaptation and come from a Japanese tradition, many people feel like sashes are not only unnecessary, but that they taint traditional Kung Fu. In reality using a belt or sash as a way to rank a student in any form of martial art is more of a motivational tool than a universal symbol of skill level. Kung fu sashes are no different.